We’ve all had them; we all crave them: those magical nights in an opera house when you know history is being made. We even remember the dates. On 07 May 2007 the air inside Theater an der Wien crackled with anticipation before the premiere of Leos Janácek’s Z mrtvého domu (From the House of the Dead) in a production by Patrice Chéreau conducted by Pierre Boulez. No one was disappointed: it was, indeed, history, which continued to mesmerize audiences throughout Europe and even the Met. This week’s performance comes from the Festival International d’Art Lyrique d’Aix-en-Provence a few weeks after the Wien world premiere with the same cast. Highlights among the massive ensemble cast include Olaf Bär, Stefan Margita, John Mark Ainsley, and Gerd Grochowski. 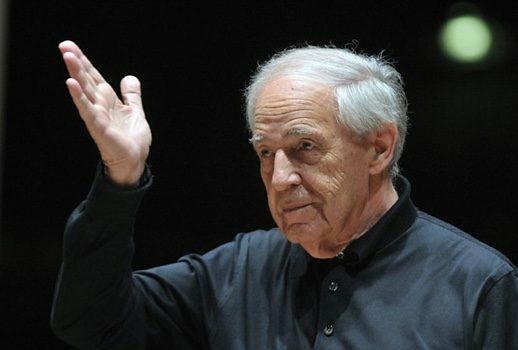 Boulez was already 82 and, avoiding travel, stayed with the production for only a few of its first stops. He had even broken his vow that the 2004 Christoph Schlingensief production of Parsifal at Bayreuth (another night for the history books) would be his last opera. We were so lucky to have him, especially teaming-up again with Chéreau! Only a decade has passed and they are now both gone. Janácek never saw his last opera: he died with the vast majority of it completed (it was finished by two of his pupils); it received its world premiere in Brno in 1930, two years after his death. To many, it is Janácek’s greatest achievement, doing away with linear narrative and his nearly-lifelong obsession with the much-younger Kamila Stösslová, who inspired many of his female characters. Indeed, the sole role for a women in Z mrtvého domu is very small, that of a whore. Janácek crafted his own libretto from the 1862 semi-autobiographical novel by Fyodor Dostoyevsky with the same title. Rather than stick to one story, it attempts to convey the conditions of prison life and the character of the convicts. While several stories are told and there is even a “play-with-a-play,” the work is best judged in its entirety. It features the largest orchestra he would call for in an opera and his most fascinating, complex orchestrations such as chains used as a percussion instrument. If you don’t know the opera, don’t let its grim title get you: it has moments of comedy and even optimism. As always, Janácek grabs your interest from the downbeat and never lets up for 94 enthralling minutes. We are nearing the completion of Janácek’s operas on my Mixcloud site: look forward to Vylety páne Brouckovy (The Adventures of Mr. Broucek) and Kát’a Kabanová in the coming months. Finally, your lesson in Czech pronunciation for the day: z’mairt-VEY-ho DOHM-ooh. Did we ever attempt Príhody lisky Bystrousky?